A motivating timepiece packed with fitness guidance, health insights, music storage, apps & more. 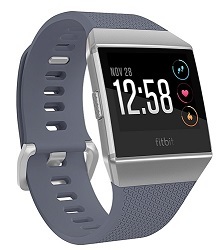 Get a watch that gives you more with Fitbit Ionic — a motivating timepiece packed with fitness guidance, health insights, music storage, apps & more. Enjoy rich, detailed sound with enhanced bass response without inconvenient cables and cords. Bluetooth wireless capability lets you listen to audio from up to 33 feet away, while our fully fl exible behind the neck band provides added comfort and security and folds for travel. Works with Melody Music Assistant that allows you to use your voice to access music while on the go, no Wi-Fi required. Comfy custom fit ear cushions in different sizes make extended listening a pleasure, while the magnetic housing makes storage easy when not in use. Rechargeable battery provides up to 6 hours of continuous use. IPX4 rated rubberized, lightweight design is sweatproof, rainproof and splashproof, great for active use. Built-in echo-cancelling mic allows you to have wireless phone calls and on-ear touch controls put track selection, play/pause, answer/end calls and volume control within easy reach. Travel pouch for added portability. Store and play 300+ songs on your watch—plus download your favorite Pandora stations or Deezer playlists. Battery life of 5 days and up to 10 hours when using GPS, so you can track day to night without charging. Get better results with a smarter scale.